Auto-Sleepers is celebrated for its coachbuilt motorhomes and panel van conversions, many of which feature in our annual Motorhome of the Year awards. It also builds a popular campervan – the VW-based Topaz – which has been in production for 19 years on the VW T4, and currently, the T5. 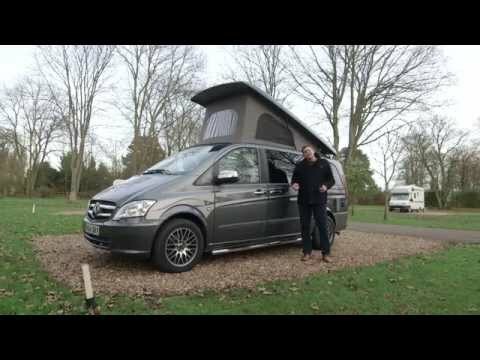 Auto-Sleepers followers were perhaps surprised when the Cotswolds-based firm turned its attentions to a different base vehicle last summer, launching a new camper on the Mercedes-Benz Vito. A relationship with Mercedes is nothing new, of course, as Auto-Sleepers currently builds six coachbuilt motorhomes on the Sprinter chassis. The new Wave, though, is a different beast from these flagship offerings, but it also combines the finesse of desirable Mercedes-Benz underpinnings with the build quality and durability of an Auto-Sleeper conversion. Both the Wave, on test here, and its Wave HL (high line) variant, offer the flexibility of a vehicle that can double as a daily drive and capable camper. To see how well the Wave performs in both roles, we took our long-term test unit to an award-winning campsite, Broadhembury Caravan and Camping Park near Ashford in Kent, which was a finalist in our Top 100 Sites Awards in 2015. With its name evoking trips to the beach and its funky graphics reinforcing that theme, the Wave seems pitched at those who enjoy active outdoors pursuits. This sense was bolstered in our test unit, courtesy of the Premium Pack of options, by featuring smart alloy wheels, chrome running rails and tinted rear windows. The Vito has an appealing exterior, with pleasing lines and colour-coded front skirts. Its aerodynamic shape hints at good on-road performance, while the three-pronged Mercedes star on the front grille suggests pleasurable driving, while simultaneously sating the badge-conscious. The Wave features a Reimo pop-top to give a standing height of up to 2.27m (7ft 5in). Zipped panels in the front and sides open to provide ventilation. The design and finish of the living quarters references that used in an Auto-Sleepers panel van conversion, especially the light-toned cabinetwork. This is paired with oatmeal upholstery with dark-brown leather leading edges and beige drop-in carpets. The Wave is based on the long-wheelbase Mercedes-Benz Vito Dualiner MPV with a 113 CDI engine, producing 136hp, as standard (163hp is a cost option). Our test unit was fitted with a five-speed automatic gearbox as part of the Premium Pack – the standard spec offers six-speed manual transmission – and motive power goes to the rear wheels. Given the quality of the underpinnings, the Wave drives well. Visibility from the cabin is excellent and rearwards vision is good thanks to the large overtaking mirrors. It’s easy to find a good driving height using the adjuster on the driving seat’s right edge. The backrest adjustment is harder to reach, though; it’s further to the rear and is partially obstructed by the seatbelt and the tied-back cab curtains that attach to the B-pillars. A pair of belted travel seats is fitted in the rear, making four in total. The cabin’s ergonomic layout has the essentials close to hand. Retractable cup holders are located in the dashboard and there’s a central storage pocket between the driver and passenger. There were only two steering column stalks on our test ’van – both located on the left-hand side: one for the optional cruise control and speed limiter, and below that, one for the indicators, which incorporates the windscreen wiper controls. The steering is precise with good handling. The ride is firm without making a big deal of road imperfections, while road noise is minimal. Only a slight whistling from the pop-top at higher speeds betrays the fact that you’re riding in a campervan. Cruising at 60mph on the motorway, with the vehicle loaded with camping gear for one person, the engine was happy to sit at 2000rpm. For one journey of 106 miles, average fuel economy was 35.4mpg, according to the on-board computer, in line with Mercedes’ stated economy figures on the combined cycle (37.7mpg). Standard driver aids include adaptive ESP (electronic stability program), adaptive brake lights and safety steering column. The Wave has a pair of sliding doors, and eschews the usual offside kitchen campervan floor plan, so the living area can be accessed from both sides of the ’van. The lounge can seat four – two in the rotated cab seats and two in the rear travel seats. Operated via a catch on the inward side of the seat plinths, the front seats both have a table mount for mealtimes. To add a table, unclip its supports from the rear bulkhead and unclip the tabletops from the tailgate. These attach to the mounts, can be moved into position easily and secured using screw tighteners. The well-sprung rear seats are high quality. Lumbar support comes courtesy of wraparound cushions that attach via Velcro and can be moved up and down the backrest. Natural light enters through the side windows and the elevating roof, with its removable sides and front lowered. Small strip lights above the doors provide illumination at night. The Wave’s lounge area is comfortable. The optional Webasto diesel-powered heating unit allows the ambient temperature to be controlled precisely, the control dial for which is located on the wardrobe wall, on the rear offside. Our test team felt this would have been better placed on a rear seat base, allowing the heater to be operated from the seats or beds. With a central gangway created by fixed travel seats on each side of the vehicle, the Wave’s galley is split across the ’van. On the nearside is a small sink with fold-down tap, below a smoked glass lid. Under this, beneath a storage cubby, is a small grill unit. Opposite is a two-burner gas hob with a glass lid, atop a large drawer housing a cooler box. There’s a good amount of work surface, especially with both lids lowered. Each side of the kitchen gets a small strip light, supported with mood lighting that shines into the elevating roof. Three plug sockets are fitted in the galley. Some of our test team wondered whether the kitchen was too generously specified for occasional camping, and whether some space could be better used to extend the sleeping berths. A Truma water heater was fitted to our test ’van, as part of the Premium Pack, to provide hot running water for washing-up. Two berths are easily deployed for sleeping. Each makes up by rotating the front seats so the backrests are out of the way, then sliding the rear seat bases forward by releasing a catch on the inside of each seat base. The bases slide on rails and the backrests fold flat to fill the space they vacate. It takes a couple of minutes and provides single beds the same width as each rear seat. The berths cannot be moved into the gangway, so occupants must sleep separately. Our testers were under six foot tall so found both beds could accommodate them. For taller users, the nearside bed is the better option. When converted, each berth offers good back support. Using the Wave in the winter months, our testers found it essential to close the elevating roof vents so that warm air wouldn’t escape too quickly. They also faced a nightly issue with the Webasto heater: the noise level produced by the unit seemed married to the heat output required; turning it down to decrease the volume lowered the temperature. The Wave does not feature a washroom but a Porta-Potti cassette toilet can be specified as a cost option when you order the campervan from Auto-Sleepers. Storage space is at a premium, but you still get a small half-length wardrobe, in the rear offside corner, plus four cubbies and a cupboard to choose from in the kitchen units. Some space is available under the rear seat boxes, although the offside one is home to the diesel heating unit. In the cab, you’ll find a glove box and a storage pocket under the gear shift. Further storage, including a pair of bottle holders, is available in each of the doors. Standard kit includes swivelling cab seats, driver and passenger airbags, fresh water tank, electrical portable coolbox, external shower point (accessed via the tailgate) and externally accessible 230V mains socket. The Premium Pack of options (£2500) adds cab air conditioning, cruise control, Webasto space heater, Truma water heater and Bluetooth connectivity. The Chrome Pack (£833.33) adds chrome body fixings to wing mirrors and door handles, chrome running bars and alloy wheels. Additional cost options include a 163bhp engine upgrade, Porta Potti, drive-away awning and five-speed automatic transmission. With its surfer-friendly name and funky graphics, the latest Auto-Sleepers collaboration with Mercedes-Benz seems pitched at young outdoorsy types. Priced from just under £50,000, though, potential buyers of the Wave will most likely be a bit older. Whoever buys one will enjoy the immaculate mechanicals and another top-drawer Auto-Sleepers van conversion, but this isn’t a campervan for prolonged tours. It’s a capable daily drive that will happily double as an occasional camper, and one with a very generous galley area to boot. We wonder if the kitchen is a little too generous for a camper, and whether an inch or two could be trimmed to make the beds longer. You can arrange to see the Wave at branches of Marquis Motorhomes and other dealerships selling Auto-Sleeper motorhomes.